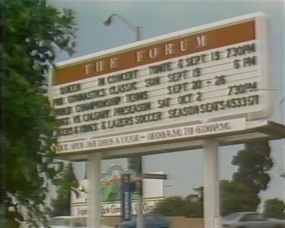 This is the first of two consecutive nights at the LA Forum. They were originally planned for September 17/18, according to an early tour itinerary. 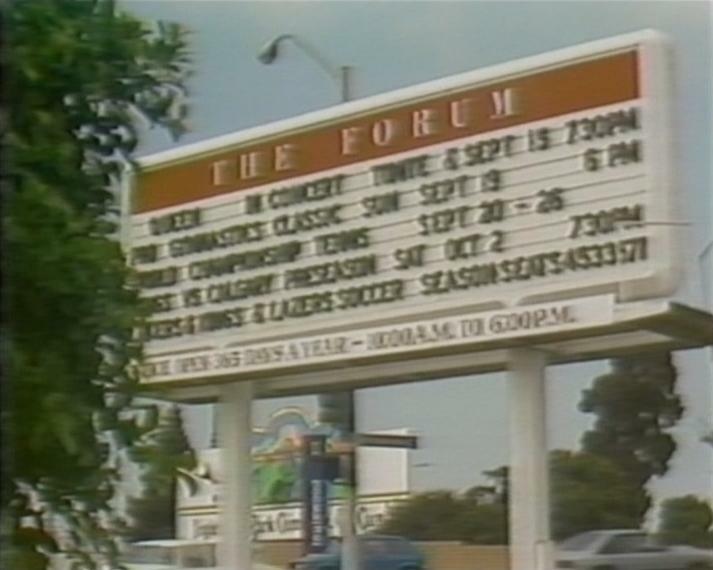 The picture above is the billboard outside the Forum as it was seen on this day. It was shown on a 1982 TV report along with interviews with the band, included on disc 2 of the "Queen Rock Montreal & Live Aid" DVD. Thanks to Pittrek for the screenshot. Brian May breaks a string a couple minutes into his solo spot. While the Red Special is being restrung, he once again plays the Flying V, something which he did only a few times, and only on this tour. An MTV report was aired around this time with a clip of Brian tuning backstage before the show, part of which shows him playing his Flying V.
A fan wrote to Brian about this show.